With the exponential growth of data being generated around the world and the increase of applications that can take advantage of real time massive data processing for high performance, data analytics, business intelligence, national security and â€˜Internet of Thingsâ€™ applications, the market demands faster and more efficient interconnect solutions. 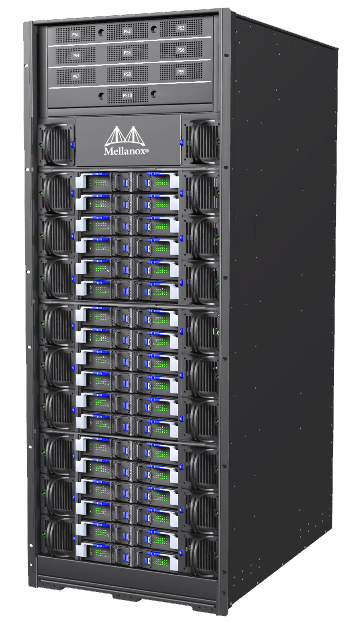 The CS7500 series provides the highest performing fabric solution by delivering high bandwidth and low-latency to Enterprise Data Centers and High-Performance Computing environments in up-to 28U chassis. Networks built with the CS7500 series can carry converged traffic with the combination of assured bandwidth and granular quality of service. CS7500 smart network switches are designed to enable in-network computing through the Co-Design Scalable Hierarchical Aggregation and Reduction Protocol (SHARP)â″¢ technology. The Co-Design architecture enables the usage of all active data center devices to accelerate the communications frameworks using embedded hardware, resulting in order of magnitude applications performance improvements.